Before viewing ThePokerfather.com website please check to make certain that online gaming is legal in your country/state/province of where you live. Certain countries have laws against internet gaming. People who reside in areas where online gaming is forbidden should not gamble online or use any of the information provided by ThePokerfather.com to gamble on the world wide web. Furthermore, ThePokerfather.com should not be used by people under the legal gambling age of their jurisdiction. 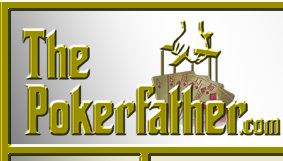 By viewing the content on ThePokerfather.com you are representing that you are of legal age to gamble. 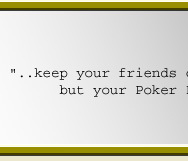 The information contained on ThePokerfahter.com site is for news and entertainment purposes only. Any use of this information in violation of any federal, state, or local laws is prohibited. ThePokerfather.com makes no promises on the outcome of your wagers and gives no assurances as to whether you will win or lose money. Poker is gambling, and people can and have lost their money, sometimes in substantial amounts. ThePokerfather.com does do reviews of the websites, however, ThePokerfather.com makes no assurances that your experience there is consistent with the reviews found on this site. 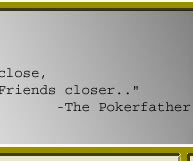 ThePokerfather.com assumes no liability for any losses you may incur at the reviewed websites. Gambling can also be addictive. ThePokerfather.com is not intended for gamblers who have problems (ie. compulsive gamblers). If you or someone you knos is a compulsive gambler please visit Gamblers Anonymous for help. None of the material contained within ThePokerfather.com or communicated via its forums, mailing lists, or emails should be construed as legal advice. If you are seeking legal counsel you should contact an attorney who is licensed to practice law in your jurisdiction.